Most of the antique porcelain marks and early pottery marks that the beginning collector encounters on antique or ancient Chinese ceramics have their origin in the Ming and Qing dynasties, or are from the republic period. Few of us will ever be able to lay hands on marked porcelain of the Song or even the Yuan dynasty. They are extremely rare. 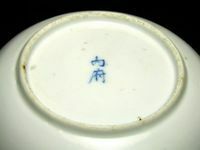 While European porcelain manufacturers usually applied a factory mark very early on, antique marks on ceramics from China rarely show which kiln actually made an item. The manufacturer's name was virtually never mentioned before the late 19th century - there were almost no maker's marks in existence in ancient China. See Antique China Marks - a comparison. Yes, there do exist antiques with so-called shop or factory marks, but they represent only a very small fraction of all the Chinese marks known. Only items specifically made to order for local clients or overseas Chinese communities in Southeast Asia seem to frequently show shop or manufacturer's marks. One of the most common antique porcelain marks found on ceramics throughout the ages is the reign or period mark (Jinian Mark). Antique pottery marks of this type are known to have existed as inscribed marks on ancient pottery as early as the Qin and Han dynasties (see China history timeline). There are also some marks known to exist on ceramics of the Three Kingdoms period (3rd century). These are all relatively rare, however. Real marking of items did not take off until the Ming dynasty. Some Chinese antiques' porcelain marks or pottery marks contain dates of the Chinese 60 year cyclic calendar, but these are actually quite rare. Cyclic calendar dates started to appear mainly on Qianjiang-style dated porcelain in the second half of the 19th century. But these are not marks proper, but rather part of the signatures of porcelain artists. 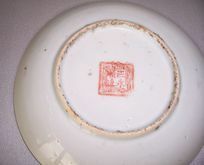 Antique porcelain marks more often than not show the emperor's reign title (period name). During the Kangxi reign pictorial marks were popular, symbol marks and double circles were especially frequent. These had already existed earlier, but only in a limited manner. Otherwise, the majority of antique porcelain marks consisted of hand-written characters. Zhuanshu marks (seal-type marks written with Zhuanti characters) were usually written or painted one by one manually during the Qianlong, Jiaqing and Daoguang reigns. Only in the later Qing dynasty (19th century) stamped seal marks started to appear more frequently. The imperial marks used during the Qianlong reign, for example, were written by hand with archaic characters (Zhuanti or Zhuanshu) in the square shape of a seal, usually with or without a hand-painted frame depicting the square seal edge. This is exactly the same way seal characters are/were written before carving or engraving the characters in a seal today. Needless to say that the ancient characters used in such seal type porcelain marks are not the normal characters used in everyday writing of the Chinese language. This ancient character type is called Zhuanti (or Zhuanshu) and was and still is mainly used with seals (even today) and is more difficult to read, even for a Chinese person. It takes some practice to recognize this type of characters in porcelain marks. So don't be surprised if not every Chinese person is able to read such characters. Later, in the 20th century this mark came into use for apocryphal Qing dynasty marks on copies and imitations of earlier porcelain. These 20th century marks are using a slightly different writing style, however, and are generally easily recognizable as apocryphal marks. Basically, the number of types of antique marks used for ceramics manufactured in the official kilns during each reign period is limited. These kilns operated under the supervision of court officials and everything, including the decoration, was strictly regulated. The usage of marks on these was also restricted by the court, and this in turn did not allow for the multitude of marks used by private kilns (Minyao). Antique porcelain marks or potter's marks containing the artisan's name were very rare on ceramics made by private kilns until the 19th century. On imperial porcelain such marks were virtually non-existent. The only exception of personal marks were perhaps the marks applied in the 18th century by Tang Ying at the imperial kiln at Jingdezhen. Tang Ying was the official assigned by the palace as kiln overseer. He is credited with an excellent contribution to the ceramics manufactured at the imperial kiln during his time. He sometimes applied a mark representing him. About a dozen of his marks are known. Generally said, individual potter's marks were otherwise non-existent on imperial porcelain or pottery. During the Yongzheng reign imperial marks used mostly marks with Kaiti characters (Kaishu), many of these are placed in a double circle. Qianlong imperial marks on the other hand used mostly Zhuanti chracters (Zhuanshu) in underglaze blue. See list showing predominant mark style for each Qing dynasty reign. During the early years of the Kangxi reign no marks were used on imperial wares. However, private kilns (minyao) did use reign marks. This practice was however prohibited later (in 1677) by an edict of the governing official of Fuliang the area, where Jingdezhen is located. In 1680 (19th year of Kangxi) Jingdezhen fired porcelain for the Qing court for the first time, thus becoming the site of the Qing imperial kiln. Continuing the legacy of the Ming period, most Kangxi wares used Kaiti (Kaishu) marks. The antique porcelain marks remaining show that only about 5% of all marks were written in Zhuanti characters during that reign. Notable is that some imperial marks do not contain the reign name, but rather the name of an inner palace within the area of the imperial palace - the abode of the emperor or empress. See exceptional reign marks.